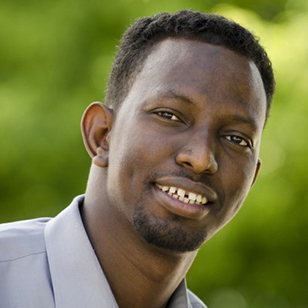 Ibrahim Hussein is the Executive Director of the Somali American Cultural Society of Owatonna (SACSO), which started with a $5,000 “Speak Out” grant from SMIF. In 2012, he won the Virginia McKnight Binger Unsung Hero Award. What was your path between Somalia and Minnesota? How did you end up in Owatonna? I left Somalia at the age of six (the civil war broke out in 1991) and moved to Kenya, where I grew up in the world’s largest refugee complex, Dadaab. I wanted to further my education, so that was my main purpose of coming to the United States. I had a lot of family in Minnesota, and they encouraged me to come to Owatonna. I came to Owatonna in December of 2007. Every year, I share my story with 5th graders. What were some of the sources/inspirations that led you to the development of SACSO? I’d been a teacher in Kenya. The only job experience I had in Kenya was in the field of education. Coming here, life was tough because I couldn’t get a job in education. I couldn’t even get a custodian position at the schools. 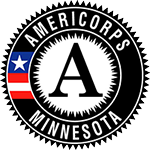 Finally, I got an assembly line job in Faribault, then I got a two hour job at Wilson Elementary School in Owatonna. After a month there, the junior high needed a Somali liaison for three hours, so I started there, too. Then another full-time position came up at McKinley School. While working as a liaison, I realized there was a huge unmet need. The Somali students were behind because they couldn’t do their homework because there was a language gap and they didn’t have anyone to help them. I was getting phone calls from parents saying “I don’t speak the language and there is so much homework,” or “I’m a single mom and don’t have the time to help with everything.” I was new and couldn’t do too much, but I could set up a time to go to their house and sit down with moms at night and help with homework, communicate with teachers, and so on. Then there was a Speak Out event hosted by Southern Minnesota Initiative Foundation at Riverland Community College to help immigrants in the workforce. At the time, I was working three jobs. I went to the Speak Out and presented all that I was doing, and SMIF and Riverland gave me a $5,000 grant. SACSO was started in 2011. Now we have about 30 students who come to SACSO for extra help in school. We sit down with them and work through homework. These volunteers help them for two hours after school on their homework so when they go the next day, they are ready. In the last 4 years, we’ve had at least 5-6 students who never had an education background who are now in college. That really makes me proud. I get cards from kids in college thanking me for starting SACSO. How do you feel SMIF has helped support the mission of SACSO? Southern Minnesota Initiative Foundation really believed in me. I got that first $5,000 grant from SMIF, and then about five months later they nominated me for the Virginia McKnight Binger award, and getting that was a huge help. When I go into SMIF’s office now, it’s like going into my second office. They are great people, great friends. They opened doors for me. They gave me so many opportunities. Now, SACSO has our own 501c3 to be able to apply for other grants. We needed to demonstrate in initial grant applications that we were financially stable, so having SMIF as a fiscal host was really important at first. They jumped in to help out with the 501c3. I cannot summarize in words what SMIF did for us. They have helped make SACSO what it is today. What specifically were some of the cultural barriers or places where the Somali families you were working with felt like they weren’t being supported? The culture is so different. When students come to America, they expect everything to be gold and that everyone lives the best life in the world. They think you just push a button and food comes to you. Then they show up and you have to pay bills, pay rent. There are still worries, not everything is easy. Everyone we left back home calls seven days a week saying “we are dying here. Please send support.” They have that dream there, and we struggle here. It is tough. Every month we send money. Every Somali you see here is sending money home. That is how we support each other. If you send $100 a month, that would give a family of seven the best life possible. However, there is a barrier. There are not connections between Somalians and Americans in Owatonna. I see that. If you introduce yourself to your Somali neighbors, I know for sure they will greet you with a smile. But we’re isolated from each other. I have great connections with people at the schools, with the police. But not everyone does. We meet seven days a week here and pray five times a day here for prayer. This building used to be our mosque. However, nobody coming here to pray was going out to the people around the building to say hello. That’s what the prophet Mohammed used to do. It’s my responsibility to go to the north, east, south and west and know 40 people on each side. Mohammed would go out in the mornings and meet with people. We need to do that and offer for people to know us. American families need to do the same thing. People think that SACSO is just for Somalis, but as a 501c3, we are here to help everyone. I’ve been doing work with the Hispanic population here in Owatonna. There are even a lot of American kids that need help. We’re here to help all kids succeed. I work 100% with Owatonna teachers. I’m always free to email them for help with a student or whatnot to make sure they are on the right track. I’m just always chasing my American dream. I’m currently a student at Winona, getting my bachelor’s degree in education. As we are in post-election, it is clear that there is a divide in many of our rural communities. What do you think we – SMIF, and all of us individually – can be doing to help bridge that divide? There are great leaders in Owatonna. Every community in every nationality has some bad people. Being a leader, you will always encounter those people but you have to move on. The Somali community is brainstorming an event in Owatonna to reach out to the American community. If we don’t know our neighbors, they will not know you. I am an American citizen and I support my country. When I was getting my passport, I swore that I would support my country. I support those who have died for the United States. I support the VA here in Owatonna. I am a member of human rights commission here in Owatonna. I have never ever left someone alone who has said “I am homeless. I am a veteran.” In Africa, we support these people as a community. This is what I told the human rights commission. We have people who have sacrificed their lives for this country and we have people driving past these people in their beautiful cars without a second look. No one is 100% good. We all screw up. However, if people want to change, there has to be support for that.